While there is growing awareness of the role that the workplace plays in affecting our mental wellness, workers can also take steps towards promoting their own mental well-being by building a strong resilience to stress – a process referred to as mental fitness. 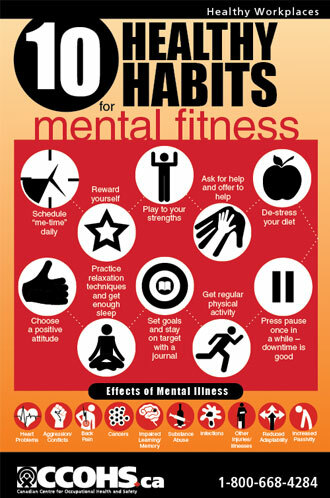 Display this poster of ten practical and easy to follow, healthy lifestyle habits that are shown to improve mental fitness, throughout your workplace. By actively practicing mental fitness, we can elevate our health and work performance, while effectively managing varying levels of stress.